To mark the success of Britain's Olympic and Paralympic heroes of 2012, Royal Mail decided to honour the athletes by painting postboxes gold. In other countries, awards were also dished out. In Botswana, teenager Nigel Amos was given six cows by his nation's government after bringing home a silver medal in the 800m. 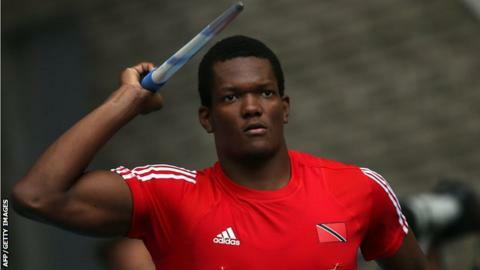 Following an unexpected gold medal in the javelin competition for Keshorn Walcott, the good people of Trinidad and Tobago celebrated. They renamed his old school and a lighthouse after him in his hometown Toco. Like Amos, Walcott's focus is now on Glasgow and the laidback Caribbean athlete is in good humour. "They might name the town after me," laughs the 20-year-old, reflecting on what may happen if he followed up his Olympic success with Commonwealth gold. Reminders of Walcott's success are all around him in Trinidad and Tobago. He returns to the school that now bears his name to teach the next generation of javelin throwers, and enjoys looking at the lighthouse while relaxing on the beach near his childhood home. It all goes back to that special day in August 2012 when Walcott came out of nowhere to win Olympic gold. He said: "Going into the competition in London, my main focus was making the final. "After I got into the final, my coach and I spoke as we said hopefully we can make it to the top eight and that would be a huge achievement for me. "I am known now in Trinidad. Most places I go to, people point me out, they come up to me to ask me for pictures. "My privacy isn't what it was before. It doesn't bother me, as I am glad the people are happy for what I did. It makes me happy knowing they are appreciative." Following his 2013 season, when Walcott was hampered with injury, he is now looking forward to competing in Glasgow this summer. "I am excited as this is going to be my first Commonwealth Games. Hopefully I go out there with the best of my ability, 100% fit. "It is not as big as the Olympics but it still has its standards. All international Games are important. "Winning a Commonwealth medal would be a huge step for me, a bonus and a boost of confidence." Walcott, like many of his countrymen, started his sporting life with ambitions of being the next Brian Lara. He eventually tried out athletics and was a natural at javelin. He won the CARIFTA Games in the Caribbean at under-17s (2009) and under-20s (2010, 2011 and 2012). He took his place on the world stage by becoming the world junior champion in 2012. Only a month later, he won the gold medal in London. At an IAAF Diamond League meeting in Doha last year, Walcott sustained an ankle injury. To his later cost, he didn't pay much attention to it. At the World Championships in Moscow in August, he continued to struggle with the injury and didn't make the final of the competition after finishing 10th in one of the heats. After some rest, Walcott now believes his ankle is back to normal. He is currently on a six-week training camp in Cuba and he plans to compete at a few events in May before taking part in another training camp in Europe so he can adjust to Glasgow's climate. He said: "My coach (the Cuban, Ismael Lopez Mastrapa) likes me to get away from a lot of distractions and just focus on training and being healthy. "I looked at my discipline and Europe is always the powerhouse of javelin. I would really like to go somewhere in Europe. I went to Finland last year and I really like it there so maybe I will be back there when it heats up a little bit." So what does an athlete who has achieved the pinnacle of his sport as a teenager hope for in the future? "I am really trying to stay focused," he added. "My real target was the 2016 Olympics. I am really looking forward to that. Hopefully I can win the gold medal there. That is what I really want." Another ambition is to beat the javelin world record, currently held by Jan Zelezny at a staggering 98.48m. Walcott's best so far is 84.58m, his winning throw at London 2012. The preparation of Walcott and Trinidad and Tobago was highlighted as the Queen's Baton Relay passed through the islands this week. The baton is the main attraction in the run-up to Glasgow and is travelling the 70 nations and territories of the Commonwealth before it takes a key role in the opening ceremony of the Games. For Walcott, he will continue to work hard towards his Commonwealth goal and relax on the beaches of Trinidad and Tobago with Jamaican dancehall and hip hop music in his ears. In Glasgow, this chilled-out star will certainly be one to watch.